So I was trying to figure out what my next post would be about, when BAM! Blizz to the rescue with the Cataclysm priest changes. Thanks, Zarhym! Heal (available at level 16): Yeah, like most priests, I never ever ever use Heal or Lesser Heal. Heck, I forgot they even existed! I get the idea that this revamped Heal is intended to replace Flash Heal in my typical rotations. Mind Spike (available at 81): My first new level in Cataclysm, and I get a dps spell? Sigh. Shadow DID need an instant nuke, which is what this sounds like. It’ll be available to all specs, so helpful for those times I need to DPS. Fine. Inner Will (available at 83): Buff to run speed and cheaper instant casts? Yes please! I’m sure Inner Fire will still be used most of the time, but this certainly will be handy in some fights. Leap of Faith (available at 85): The ability to grab players out of danger? Sweet! I’m not so sure I’ll be grabbing you if you have aggro, as I’m not interested in meeting your new little mob friend. I may grab you out of the fire … if I like you and if you don’t deserve to die of your own stupidity, that is. Discipline Talent: Power Word: Barrier. Oh, Power Word: Barrier, how I have dreamed of you! Instead of spamming bubbles one-by-one, I long to shield an entire group! Made of win. Divine Spirit and Prayer of Spirit: GONE! I’ll miss the spirit buff, but my Devout Candle budget just got more manageable. Mana will be a bigger consideration for all healers. We aren’t trying to make healing more painful; we’re trying to make it more fun. Ah, the ever-popular Circle of Healers. The rules say I’m supposed to link whoever tagged me, but of course, I’m brand new to blogging, so no one has tagged me. Still, I’m pretty sure that at this point, it’s actually WoW blogging law for healers to answer the questionnaire, so I presume (and hope!) that I don’t have to actually be invited to this party. Of course, the whole thing started with the fabulous Miss Medicina, so I’ll just link to her. What is your favorite healing spell for your class and why? Penance, for sure. It’s my go-to big heal. It’s immediate, for one thing, so it gets someone out of danger fast. It hits three times: that’s three good doses of healing, three chances to proc pretty bubbles and Inspiration, and a full stack of Grace. Plus, have you seen it?? It’s awesome! I also love Binding Heal, because it means I don’t have to choose between my own life and someone else’s. What healing spell do you use least for your class and why? Greater Heal. It’s too. damn. slow. Besides, I have Penance! What do you feel is the biggest strength of your healing class and why? I don’t mean to be obvious, but I’m going to have to say mitigation. Power Word: Shield, Divine Aegis, Pain Suppression… it’s all about reducing or stopping incoming damage. Not to say I’m not actually healing, of course — I do plenty of that. I can heal a single target very well, but I also am good at spamming bubbles across the raid. What do you feel is the biggest weakness of your healing class and why? Again with the obvious: instant and group heals. I have Prayer of Healing, but even with Borrowed Time, it’s kinda slow. And I wish I could do something more than Shield and Renew on the run. Particularly since Renew is not that strong for Disc. In a 25 man raiding environment, what do you feel, in general, is the best healing assignment for you? Well, I don’t 25-man raid, but I would love a chance to try out this tank healing we are supposed to be so good at. Just focus on the one guy taking all the hits. Sounds fun. In reality, I raid 10s, and we generally 2-heal. We don’t do assignments; we just work together to keep the raid up. What healing class do you enjoy healing with most and why? Druid healers are teh awesome! (Disclaimer: This reply has nothing to do with the fact that my main raid co-healer is a tree.) Seriously, though, I think a druid and a disc priest are great together. I can bubble folks my partner has HoTs on, protecting them from further damage while his HoTs heal them up. The battle rez is awesome, too, since sometimes I die. Plus they’re so cute, running around flailing their branches! What healing class do you enjoy healing with least and why? Other Disc priests. I’ve healed with several, and it’s fine and all, but it’s so much better to have a variety of abilities. I also find myself to be too judgey about the way they’re healing. What is your worst habit as a healer? Sniping my druid partner’s heals, because I can’t handle seeing the low health bars on VuhDo while his HoTs are working. This leads to wasted mana and overhealing for him. It’s clearly a trust issue, but it’s not him — it’s me. Do you feel that your class/spec is well balanced with other healers for PvE healing? Absolutely. I love my priest. What tools do you use to evaluate your own performance as a healer? Is everyone alive at the end? This is the only yardstick that matters. Meters are evil, but I used to play DPS, so sometimes I can’t help myself. I do log our raid nights to World of Logs and I like to see what spells I’m using the most, and where I’m overhealing. What do you think is the biggest misconception people have about your healing class? That bubbles are going to interfere with rage generation (yes, still); that I can’t raid heal in Disc. What do you feel is the most difficult thing for new healers of your class to learn? Use Binding Heal. It’s ftw. Oddly, I sometimes see new Disc priests being stingy with bubbles, too. Give them away! Give them to everyone! And don’t forget to use Pain Suppression and Power Infusion. Your group will love you. If someone were to try to evaluate your performance as a healer via recount, what sort of patterns would they see (i.e. lots of overhealing, low healing output, etc)? They would see my itchy Renew finger. I know Disc renew is fairly weak, but I just can’t stop myself. And my Renews are mainly overheals too. In part because of the nature of HoTs, and in part because I get too nervous to give them time to work. They would also see lots of bubbles. On everyone. All the time. Haste or Crit and why? Haste to a point, then Crit, Crit, Crit. My stats are fairly well balance, I think. I’d love a little bit more Crit for my Disc spec, for the bigger heals and the lovely Divine Aegis procs. I’m good on Haste for Disc, but would really like more Haste for my Holy spec. What healing class do you feel you understand least? Tree healing is a little mysterious to me, but I heal with a druid, so I understand it better than I used to. I’m leveling a shaman, so I understand what they’re doing more too. I guess that leaves Paladin — I hear their Bacon of Light is delicious, though! What add-ons or macros do you use, if any, to aid you in healing? VuhDo, how do I love thee? Let me count the ways…. As for macros, I keep Inner Focus macro’d to Divine Hymn — and yes, I use it. It took some practice to remember to use it, but it’s a great big free group heal. Definitely worth using. I also keep my trinkets and Berserking macro’d to Prayer of Healing to give it extra Haste and power. Do you strive primarily for balance between your healing stats, or do you stack some much higher than others, and why? In general, I go for a more balanced approach. I am focused on getting more spellpower at this point though, because I’d really love stronger throughput. Now the rules say I have to tag someone, so I pick Talfrund of Leveling Resto, who was kind enough to leave a comment on my humble little beginner blog. I know you’re still leveling, Talfrund, but even so… tag! Welcome to Six-Inch Heals, a chronicle of my adventures as I heal my way through Azeroth. Yes indeed, another healer’s blog. I’ve played WoW for a little more than five years now. I spent most of that time as a rogue, but in a fit of altoholism, fueled by a healer shortage on my server, I rolled a priest: the quintessential healer. The lower levels were so painful that I abandoned Sindie at level 24, but when I did eventually pick her up again, I really fell in love. 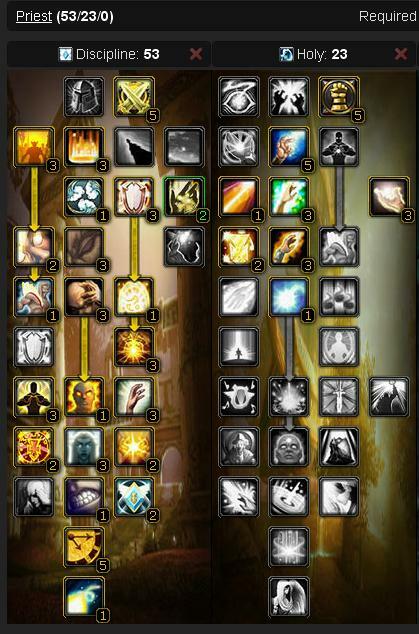 Sin’s main spec was Holy, with a Shadow off-spec for leveling. Healing was stressful at first — people died if I made a mistake! — but I loved it so much that my alt quickly became my main. Eventually, I decided to give the wildly popular Discipline spec a try, and I found the shiny bubbles quite addictive. Sindie is now Disc/Shadow, because I got tired of how slowly dailies went when I was Disc/Holy… but I could see dropping Shadow for Holy sometime again in the future. I really enjoy both types of healing. In fact, I’ve become so very fond of healing, I recently decided to level a shaman, just to give another kind of healing a try. In her early 40s, Ginger is dual-specced Resto/Elemental. The new LFG tool from Blizz is a godsend for leveling by healing instances, but I still want to be able to quest efficiently. I like the shaman style quite a bit, and needless to say, she’s nowhere nearly as squishy as Sin was coming up through the ranks. I think I avoided trying out healing for a long time because I thought it was too stereotypical for women to play healers. But really, who cares? I love healing. And my old main? The poor gal now hangs out in Storm Peaks, mostly in Naxx 25 gear, farming herbs and mixing up her alchemical concoctions for Sindie’s benefit. She seldom runs instances and she never, ever gets to raid. As for why I decided to start a blog, I thought it would be fun to get back to writing (which I used to do a bit of, even professionally), and I thought that WoW would make a great topic. After all, I spend some unmentionable number of hours a week playing it, so why not write about it? I look forward to telling you all about Sindie’s and Ginger’s adventures healing, raiding, pugging, and leveling through Azeroth.